1. Gathers information that will be of value in diagnosing any problem in the head and neck region including the teeth and gums. 2. Allows you time to get to know the staff, completely understand your dental condition and all options of therapy if necessary. Why is a Comprehensive Exam important? 1. In order to successfully treat any existing dental problem, or intercept a developing one, the cause(s) of the problems must be discovered. 2. Before any restorative or cosmetic dentistry is undertaken, detailed planning for long-term success is mandatory. What does a Comprehensive Examination include? A complete and very thorough medical and dental history is taken. Any previous x-ray films or models are reviewed. Chief complaints, previous complaints, dental experiences, and cosmetic goals are discussed. A detailed inspection of the manner in which your teeth come together and work as a unit is performed. This may include the visual, tactile examination and the use of the Doppler ultrasonic device, which give us an indication of relative health condition of the temporomandibular joint and surrounding structures. All necessary imaging is gathered that is needed for diagnosing your case. This may include a full mouth series of radiographs, x-ray films of TMJ area and digital photographs. 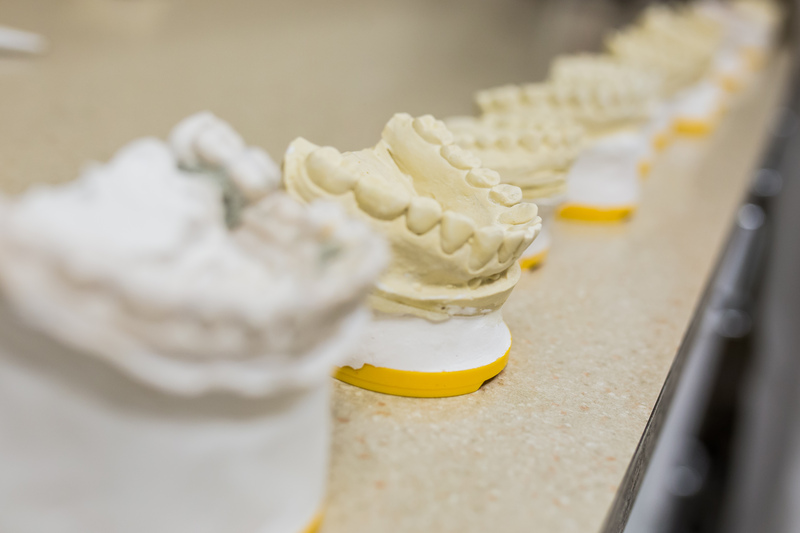 Models of your teeth are made and mounted on a customized device to evaluate your bite. A detailed inspection of the manner in which your teeth come together and work as a unit is performed. Using certain measurement tools your gums and tissue underneath are checked and evaluated for their relative health. An overall esthetic and cosmetic exam with smile analysis is performed, including photographs of your teeth. Measurements are taken to evaluate the symmetry and harmony of your teeth. They are compared to your facial profiles. Tooth whitening is discussed if desired. What are the benefits of a Comprehensive Examination? 1. You will have a complete understanding of the condition of your teeth, gums, TMJ’s, and the reason why they are in that condition. 2. If restorative/cosmetic dentistry is being planned you will have a very good idea of what is possible from a dental standpoint and desired by you. 3. And organized and detailed plan and sequence of therapy will be proposed of your desired restorative and cosmetic dental treatment. 4. By finding the cause of the possible problems and possible solutions you will be able to make a more informed decision about your dental care. When should I have a Comprehensive Exam?